Editor’s Note: This is the last in an ongoing series of commentaries analyzing the individual Guiding Principles of the Certified Signing Specialist™ Code of Conduct, released by the Signing Professionals Workgroup in October 2013. The Code of Conduct was written based on the belief that a Signing Specialist is a professional in the field of mortgage loan document signing services. While the field is relatively new, experience has taught its practitioners (Signing Specialists) that signing services are best performed by following certain standards. Many of these standards have been incorporated into the Standards of Practice in the Code of Conduct. This is healthy and demonstrates the legitimacy of the loan document signing services field. For any professional field to remain relevant, it must evolve to meet changing needs. This evolution may be driven by regulation, economic dynamics, societal trends, lender and title company requirements, and other factors. To cite one current example, on August 1, 2015, the Consumer Financial Protection Bureau’s integrated mortgage disclosure rule will take effect. The new Loan Estimate and Closing Disclosure forms may raise questions from Signing Agents that could affect how Signing Specialists perform their duties. Once Specialists encounter the new forms, standards about handling them will likely emerge. It’s not just the professional field that must evolve; professionals within the field must also grow in their knowledge and proficiency of their trade. Becoming a Certified Signing Specialist is not a status to be achieved and then neglected, but is continually nurtured through a process of self-development and commitment to excellence that goes beyond the individual professional. Guiding Principle 10 calls on Signing Specialists to become agents for positive change within the industry. Standard 10.1 encourages Signing Specialists to participate in national and regional associations of Notaries Public, Certified Signing Specialists and other real property professionals. It emphasizes the importance of being involved with the broader community of industry professionals and encourages Specialists to find their place within it. Standard 10.2 urges Signing Specialists to encourage fellow Specialists to aspire to the highest standards of professional practice and enhance their professional competencies. Meetings of Signing Specialists exist to fulfill this very purpose. The mutual sharing of “war stories” benefits everyone, since there is always something to be learned from colleagues. Standard 10.3 encourages Signing Specialists to go a step further and teach and mentor less experienced Specialists. New Specialists represent the future of the field and often seek to come under the wing of more seasoned Specialists. Providing guidance to new Specialists demonstrates commitment to the profession as a whole and not just to one’s personal financial and professional goals. Finally, Standard 10.4 encourages Signing Specialists to support the development and improvement of laws, regulations and standards of practice within their chosen field. This may be done by supporting legislation affecting Notary practices in the Specialist’s state or providing the Signing Professionals Workgroup with ongoing feedback on any of the standards in the Code of Conduct. In fact, through public comment, many of the Standards in the Code of Conduct have been immeasurably improved. 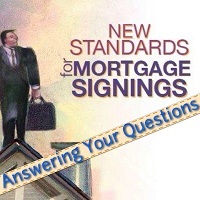 When Specialists are engaged in the standards-setting process, everyone benefits, including Signing Specialists, contracting companies that provide assignments to Specialists, lenders and borrowers.